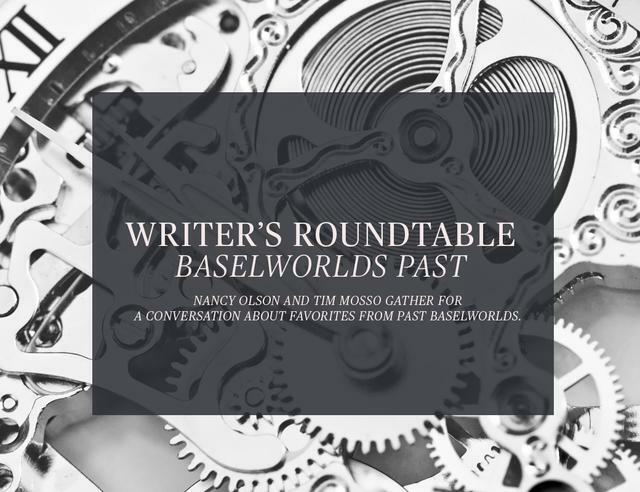 As I experience Baselworld 2016, I am reminded of years past, when new and exciting ladies mechanical wristwatches made their debut, demonstrating the evolution of the tastes of women the world over. Following are a few of my favorites. 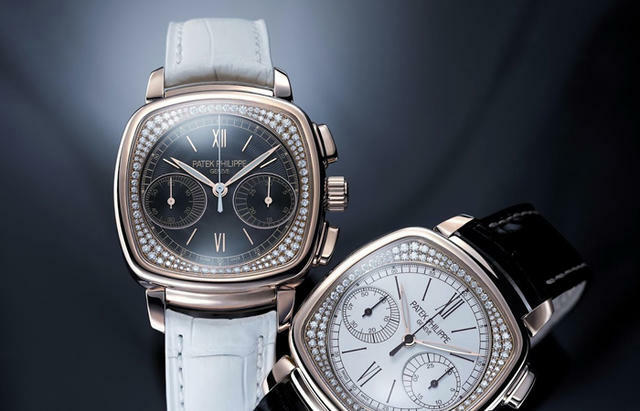 Inspired by a Patek Philippe Art Deco watch from the 1930s, this cushion-shaped rose gold Ladies First Chronograph employs the brand’s first hand-wound chronograph movement developed and crafted entirely in-house, the column-wheel-controlled CH 29-535 PS. 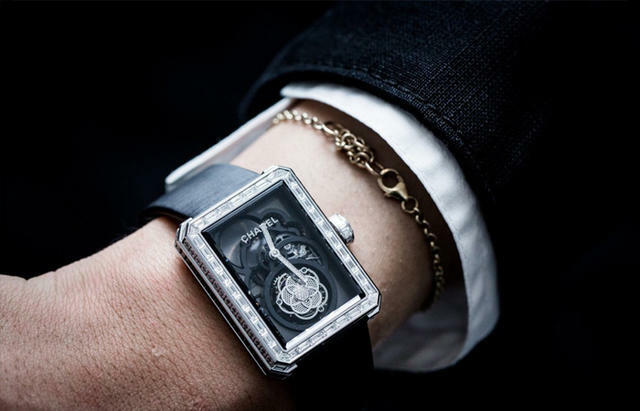 This new movement makes its debut in a ladies' wristwatch: the Ref. 7071. In celebration of the twentieth anniversary of the Happy Sport watch, created by co-president and artistic director Caroline Scheufele, a new mechanical version is introduced: the Happy Sport Medium Automatic. The 36mm steel watch features a decorated self-winding movement visible through the sapphire crystal on the caseback. 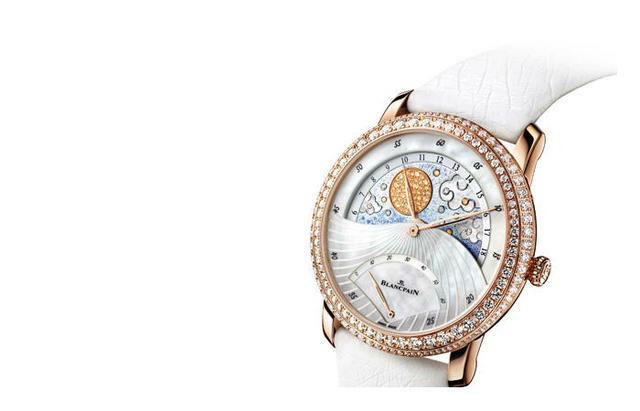 Blancpain Day Night makes its debut with a new caliber, based upon the caliber 1150, incorporating two retrograde indications and created especially for its Women collection. 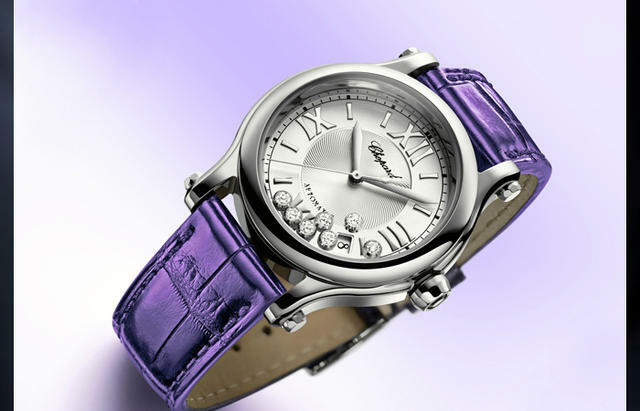 The mother-of-pearl dial is divided into three parts and is presented on four levels, featuring a variety of decorative techniques. The moon is set with fifty diamonds and the sun with fifty sapphires. 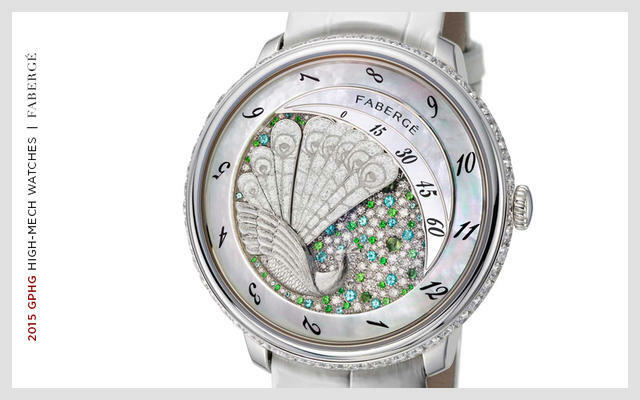 Fabergé makes a splash with its collection of ladies watches employing an Agenhor-designed retrograde movement. The Lady Compliquée Peacock is an homage to the famous Fabergé Peacock Egg of 1908 and whimsically employs the fanning tail of a peacock to mark the time. The Winter model uses a veil of frost. More than a novelty, it was a wellspring of new directions for the premier segment’s point-of-reference. As the first of the Nautilus chronographs, a landmark 30th anniversary model, and a debut platform for the company’s in-house CH-28 520 automatic chronograph caliber (a first), the Nautilus 5980 marked a clear schism point between this model line’s past and future. 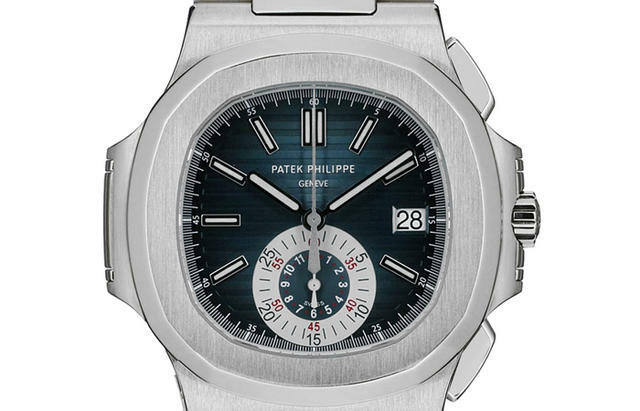 Previously a stately elder statesman somewhat disengaged from direct competition with its numerous complicated rivals from Vacheron Constantin and Audemars Piguet, the post-5980 Nautilus became and all-fronts checkmate for its competition from SIHH. Annual calendar and travel time chronographs joined the ranks of Patek’s sporting standard-bearer in subsequent years. This deceptively simple debut arrived as a virtual powder keg of preamble for the decade that was to follow at Rolex. After five model years of tending to core brands and complications - Daytona, Day-Date, Datejust, GMT-Master, and 2007’s own Yacht-Master II – Rolex launched a watch that was neither. The Milgauss never had been an Oyster Perpetual mainstay, and it had been MIA since the demise of the 1019 in the late 1980s. 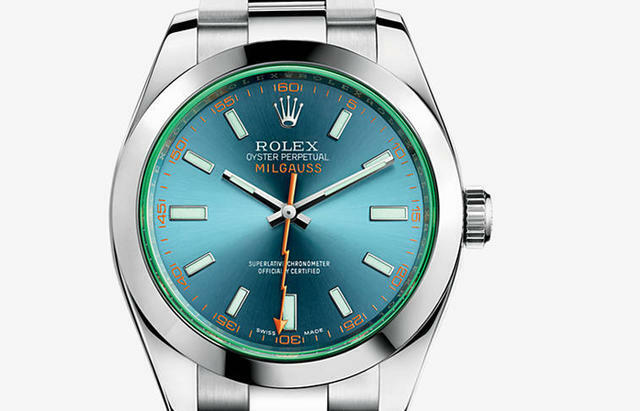 Revived as a simple time-only 40mm gateway watch for ’07, the Milgauss foreshadowed the wholesale rededication that Rolex would apply to its time-only sport collection; Explorer (2010), Submariner no-date (2012), and Oyster Perpetual (2015) models received massive revisions in the decade to come as the marketplace turn towards value and simplicity reasserted itself. Moreover, the postmodern orange lightning bolt seconds hand and dial calibrations recapitulated history without capitulating to it; the green-tinted “GV” crystal threaded the needle between audacity and raffish excess. Milgauss GV was a bold statement in 2007, and the 2014 Z-Blue variant proved that the Milgauss’ recent past truly was prologue. A subversive pick in some ways, this collection of vintage-inspired Zenith El Primero limited editions laid down a clear marker between Zenith’s delirious 2000s and the classically-cued period design that has followed. 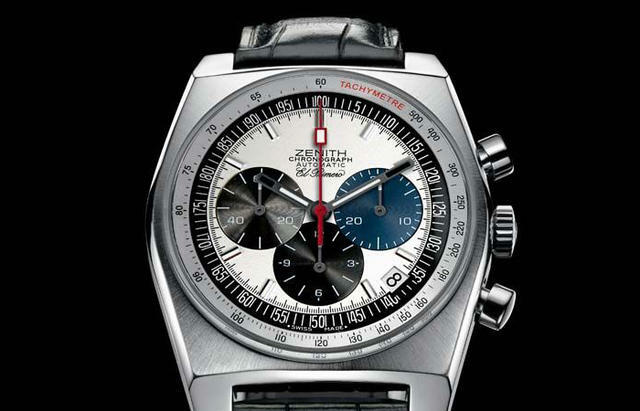 The selection is notable because it launched partly as brainchild of outgoing Zenith CEO Thierry Nataf, a figure best remembered for immense designs of outrageous sensibility (looking at you, 2006 Defy Extreme…) and love/hate responses from the Le Locle faithful. As a clear fusion of Nataf’s vision (one New Vintage 1969 model included an open dial and black titanium PVD case) and the current leadership’s embrace of heritage (each version referenced the revered 1969 A384/A385 cases), the Zenith El Primero New Vintage 1969s must be considered modern watershed models for the manufacture. Even at its 2009 inception Benoît Mintiens’ Ressence was no stranger to innovation, but the avant-garde Belgian one-man brand came into its own with the 2013 Type 3. By combining his orbital bezel-bereft core concept with a stunning oil-filled canopy, Mintiens created something truly new in an industry where the mere suggestion of authentic novelty inspires guffaws; the Type 3 delivered. Previously a regarded auteur, Mintiens and his incipient brand came into their own with the Type 3. On purely aesthetic and imaginative grounds, this novelty from a micro-manufacture can rival the best effort from the major groups. Moreover, it is a watch without pretense or haut-de-gamme hauteur from a brand that seems to remember such products should be fun above all. 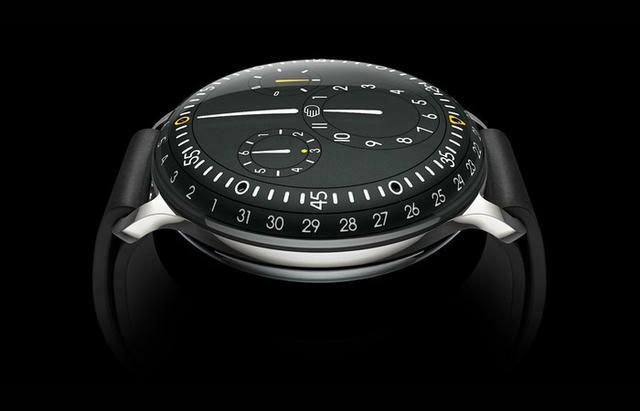 The Type 3 remains a high-water mark for independent horology to this day. 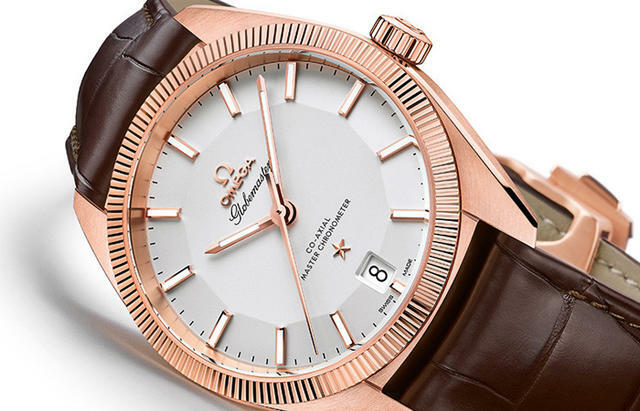 This was the reborn Constellation that Omega loyalist had craved since at least the early 1980s “Manhattan” project sank its “griffes” into the model line. The Globemaster was an overdue revival of the 1952 “pie pan” Connie dial-form in a modern package with innovative updates and powered by a new era of co-axial caliber. True, its dial was heritage-driven. But the Globemaster was no slavish “tribute” mode and bore the strength of modern case proportions and strong character lines: the better to stand the test of time on its own merits. Clever use of a fluted tungsten bezel added visual and technical intrigue to the bedrock stainless steel model, and Globemaster represented the first application of Omega’s new METAS chronometer standard in a production model. A technical pacesetter and style leader for Omega, the Globemaster’s ultimate impact remains a tantalizing mystery. However, it is destined for a long and prolific run as a classic in its own right and an anchor for new generations of Omega formal models.